Killer Whales were originally called 'whale killers'. Eats marine mammals (walruses, sea otters and penguins), and seabirds, as well as a variety of fish. Breathe air with their lungs, so they must come to the surface of the water to breathe the air directly. Cannot taste anything but salt. When it comes to the surface it exhales the air from its lungs - this is called 'blowing'. Spend all their lives in the water. If a dead whale is found on a British beach, the head belongs to the King and the tail to the Queen. Some whales are born with a small leg protruding from their body. Navigate hundreds of miles using a mental map created by bouncing sound off the sea floor. Whale milk has the same consistency as toothpaste. A newborn baby whale puts on 14 stone every day. The Blue Whale is the largest known mammal, up to 105 ft long . The tongue of a Blue Whale is the same size and weight as a fully-grown African Elephant. 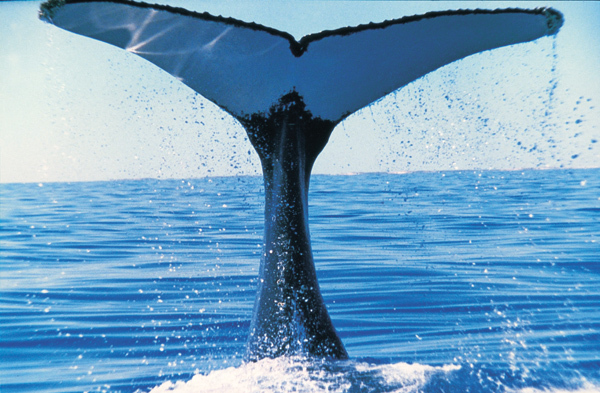 Water in a Blue Whale's mouth weighs as much as its entire body. Blue Whales can go up to 6 months without food. Can only see in black and white. Humpback whales can sing non-stop for 20 hours. The call of the Humpback Whale can be heard 500 miles away. A Humpback Whale may eat up to a ton of food a day. Humpback Whales create the loudest sound of any living creature. Sperm Whales have the largest brain on the planet. The Caribbean Sperm Whale has its own regional accent.